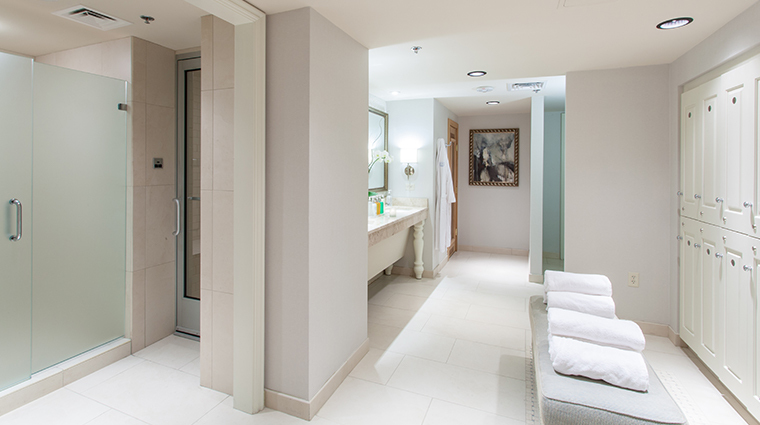 The Spa at Windsor Court sits inside Forbes Travel Guide Four-Star Windsor Court Hotel at Gravier and Tchoupitoulas streets in downtown New Orleans, only steps from the historic French Quarter. But don’t worry about the din of the nearby revelers interrupting your bliss; the quiet spa seems far away with its Old World charm combined with modern treatments and techniques. Let the professional, courteous spa staff provide you with a personal and luxurious experience with custom body treatments, sumptuous facials from internationally acclaimed brand Natura Bissé, a slew of massage therapy options and a full-service salon. It's a great way to relax after a busy day window-shopping and an ebullient evening spent dancing the night away in the French Quarter. The spa’s environment presents a soothing atmosphere with a noticeably upscale touch. With plush upholstered armchairs and padded banquettes in the lounges, soft carpeting surrounding the lockers and cool stone tiling in wet areas within the locker rooms, both your feet and your body will get to experience the luxury. 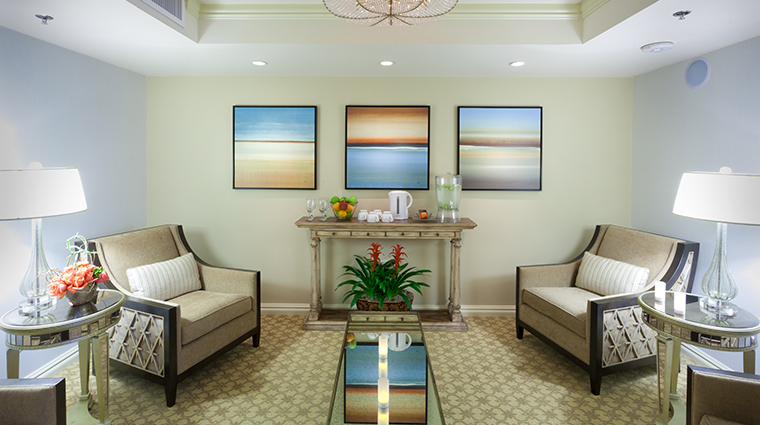 Before, after and during treatments at The Spa at Windsor Court, your therapist will offer you several other beverage options, including wine, champagne and mimosas to help ease you into a state of full relaxation. To enhance your relaxation, all treatment rooms have been wired for iPod access. So bring your iPod if you want to listen to your own music during a four-handed massage or, if you desire, select a playlist from the New Orleans spa's customized menu. Though men are free to experience most of the services on the menu, there are a couple of specialized treatments that were created with males specifically in mind. The Man(ly)cure is an intuitive treatment for the hands and toes — complete with nail shaping, soaking, exfoliating and massaging. Call The Spa at Windsor Court directly to schedule an appointment. If you are staying at Windsor Court Hotel, simply request assistance from the concierge. When you arrive, head to the fourth floor of the hotel to find the spa. You’ll know that you’re in the right place once you see the pool and gym area. To fully enjoy the spa services and luxuries, we recommend arriving a bit early for your appointment to spend time in the sauna, steam room, gym and heated pool. Starry Eyes is a unique signature signature facial that focuses primarily on the eyes, promising to brighten and awaken your look in under an hour. You’ll luxuriate in a light exfoliation, be soothed with cold stones resting on your eyelids, and finally treated to a lash tint. Sometimes, there’s just no need to reinvent the wheel. The classic Swedish Massage brings you back to the basics of spa relaxation and will certainly remind you why putting your body in the hands of a therapist works as the best cure-all. Blending a classic, luxurious Swedish massage with the firmer and more targeted points of the Eastern shiatsu massage, the aptly named East/West Blend Massage will have your muscles feeling great both during the massage and for the days that follow. The Monarch – A Detox Wrap is the key to getting rid of all the effects felt from French Quarter fun. 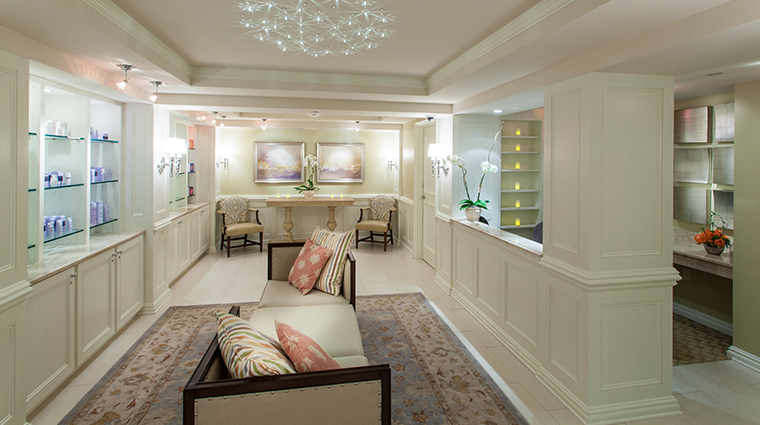 A favorite with locals and visitors alike, The Spa at Windsor Court’s salon hair treatments should not be overlooked. Book yourself that much-needed haircut, and you’ll also enjoy the high-quality products, a massaging hair wash and your desired style. When you’re ready to meet your therapist, two relaxation lounges filled with comfortable upholstered armchairs and light gray wooden credenzas will be available to you. Locker rooms have a clean, unfussy design aesthetic — white paints, earth-toned marble countertops, silver light fixtures — but still ensure you have everything within an arm’s reach. After changing into a plush robe and waterproof sandals, indulge a little with a moment to yourself in either the hot steam room or the dry sauna to loosen up your muscles and clear your head. Nearby, a few spacious showers protected by opaque glass doors are available for you to rinse off if need be, complete with spa-branded amenities. The vanity area near the sink, just steps away, has even more of these luxurious amenities, including shaving gel and razors if you leave yours at home and a hair dryer and flat iron for primping purposes.